"At New England, we believe that our highly qualified technical team leads the industry in the standards and practices it utilises to continually drive the quality levels at our factory. From the dedicated raw-material team to the process and product technologists, every member is an expert and totally dedicated to delivering great fish. Using leading-edge technologies, the team ensures that all products meet the highest standards of food safety and are world class quality." A significant proportion of the team is based in the supply chain so that New England always has its finger on the pulse, whether dealing with new species, new methods or new know-how. Bringing together all of these skills from supply chain management and raw material evaluation, to processing control and product development, ensures New England delivers. 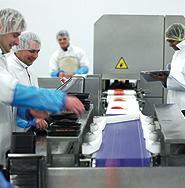 "We have a huge amount of expertise and talent for developing new and innovative products. With over 25 years combined NPD experience, we are skilled at developing original ways to make the most of our amazing fish. Working with expert filleters, we have developed new lines using unusual and often forgotten cuts." Pride in our products is demonstrated by the way we hand craft our value added lines. This allows us to pay more attention to detail and gives our products that homemade look and taste. In addition, we only use the best fresh ingredients including authentic Italian Pecorino cheese, Ciabatta crumbs and delicious fresh sauces and marinades. 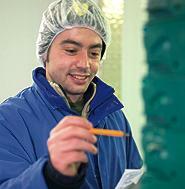 Our product technologists ensure that each piece of fish meets legal, corporate and product safety requirements.